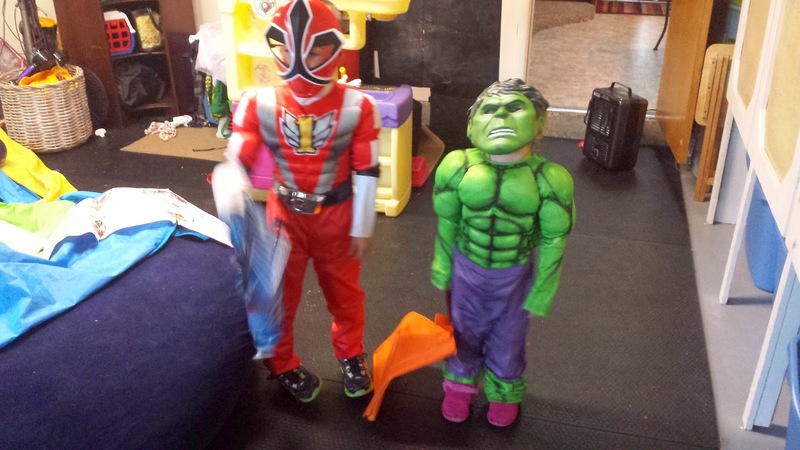 Kyle is the Red Power Ranger and Hayden is The Incredible Hulk, and please note that Hayden accessorized her costume with her favorite pink boots. I'm still not sure what they are going to be on the actual day of Halloween as they seem to change their minds on their costumes about as often as political candidates run ads these days. Thanks for stopping by. Owen was the red power ranger last year and the hulk the year before that. Wait a minute...have you been in their closet? Ha! My grandson is the Red Power Ranger this year too. I think Hulks pink boots are a nice touch. We don't do Halloween but I guess if we had young kids it might be different. Where I live it's a very quiet affair, just a few fireworks and that's about all. Hope you enjoy yours.